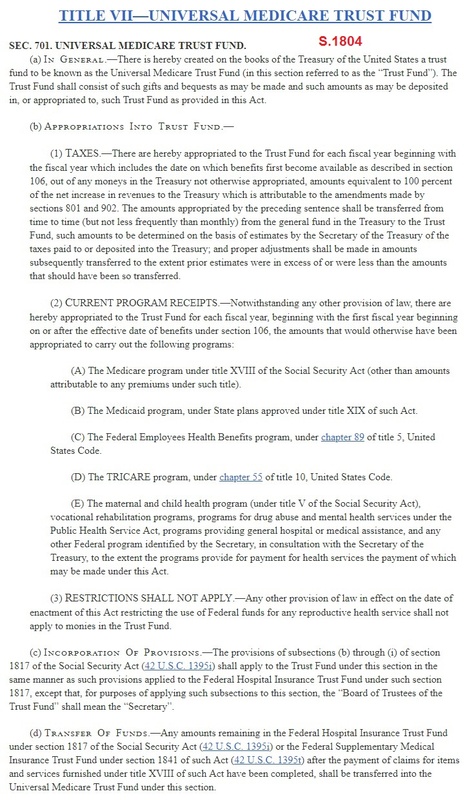 On April 10th, 2019, Bernie Sanders introduced a new version of his Medicare for All bill. Speaking as a progressive, I’m sure it’s almost entirely wonderful (the bill’s text is not yet available), but the only thing that matters is, “How neoliberal is the pay-for?” If it doesn’t have “clean appropriations” – like the super-wealthy have in all their bills, such as military budgets – then we must demand better. See the bottom of this article for analysis of the pay-for sections of five separate bills: Three major versions of Medicare for All (with terrible pay-fors) and two bills (one for the military, one for the opioid crisis) that have totally clean pay-fors. 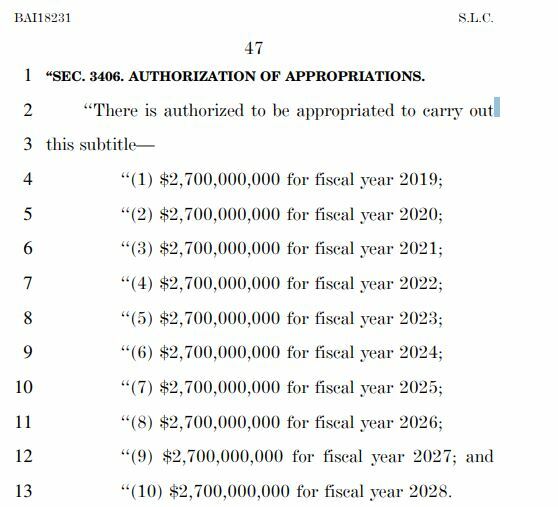 I would love to be wrong, but I would bet a lot of money that the new bill has a pay-for section with both a trust fund and raised taxes. Collecting taxes for a federal program is completely unnecessary – at least, it is from an economic point of view. A trust fund for a federal program is an artificial and unnecessary limit on a government that otherwise has an abundance with which to provide. In a 2000 paper related to another federal program (Social Security) economists Stephanie Kelton and L. Randall Wray call the program’s trust funds “an accounting gimmick.” This is because the government’s “ability to pay out benefits does not depend upon the balance in the Trust Fund. 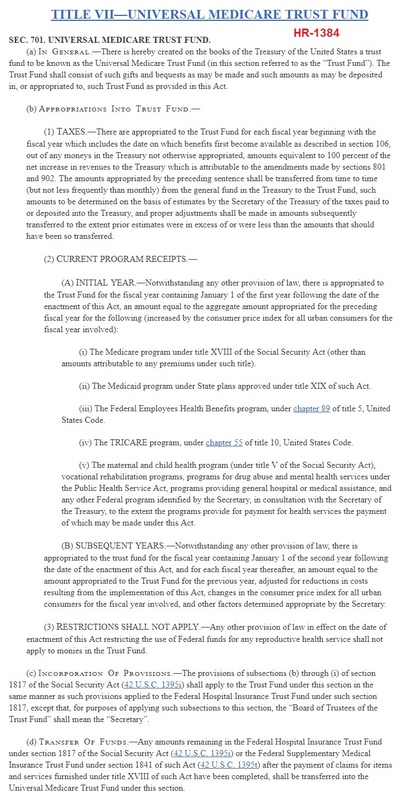 […] [T]he US government can always meet its obligation to make money payments.” In other words, although the accounting gimmick trust fund may ”go broke” (or “be stolen from” or “borrowed from”) the United States federal government itself cannot ever “go broke” – and therefore, neither can any of its programs. It can run out of real, tangible resources, but not money. To be clear, eliminating every “funding” provision related to taxes and trust funds from a federal bill does not decrease the program’s solvency in the least, neither in the short-term or long-term. What trust funds and raised taxes do, however, is guarantee many decades of political fights based on economic nonsense. They also guarantee decades of panicked calls that “Medicare for All is going broke!” (or being stolen from or borrowed from), with the added bonus of people complaining that “I bought into this, so I earned my Medicare for All,” which directly conflicts with Bernie’s own philosophy that people deserve healthcare because they’re a human being. This has been exactly the fate of Social Security for the past ninety years. Thinking that taxes (and trust funds) “pay for” federal programs is the Achilles heel of the progressive movement – they don’t. Wonderful bills can be permanently sabotaged by the insertion of a single, perfect, elegant neoliberal pay-for clause. These poison pills guarantee that the progressive bills they are attached to, if they do pass, are much easier to dilute and kill. In other words, trust funds and raised taxes are politically expedient for those who want to privatize and profit from (and control!) programs that the government currently provides for free. An article announcing Bernie Sanders’ Medicare for All re-launch asserts that “big tax increases would be needed to finance such a system.” They’re not needed – not economically – but this is exactly what comes from pretending that they do: People who object to their taxes going up and rightly protest! (“How dare you raise my taxes for your big programs!”) They protest the bill itself because they believe it has to raise their taxes in order to be viable and solvent – in order to be possible. To a significant degree, I stand with them, but for a different reason: I know that a pay-for clause on a federal program is almost always a regressive and economically meaningless tax. We will all have taxes removed from our paychecks that will never be used to pay for Medicare for All or anything else. These neoliberal pay-fors are intended not for financial viability, but rather as a capitulation to those who don’t want the bill to begin with. We must demand better. The super-wealthy always get clean appropriations in bills that benefit only them, but we the people somehow “have” to be burdened by this neoliberal ball and chain. A burden that significantly sabotages otherwise beautiful policy – that we need to survive. Fixing the Affordable Care Act is a small incremental improvement. 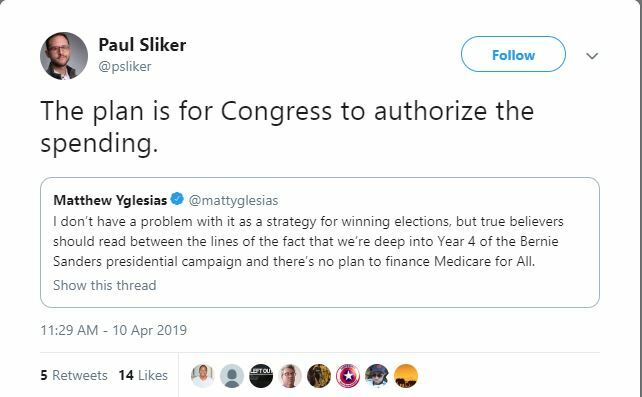 Passing any one of these Medicare for All bills, even with their poison pills, would be a large improvement, preventing the death, suffering, and bankruptcy of millions. Let’s not pretend, however, that it can’t be much much better than this. Once the people understand how the economy actually works, many more will be saved. Here are links to the entire pay-for sections of the three most prominent, currently-proposed Medicare for All bills. I still have more to learn, but this is what I currently understand regarding these pay-for clauses. Fixing HR-676 is easy: just eliminate everything in the red box. Done. That particular section (of this particular bill) is discussed in this article. 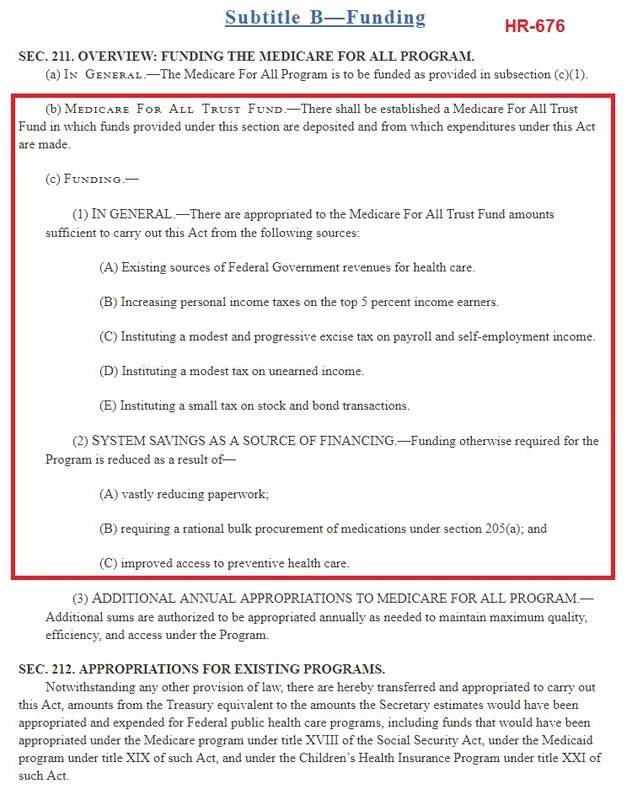 ADDITIONAL ANNUAL APPROPRIATIONS TO MEDICARE FOR ALL PROGRAM.—Additional sums are authorized to be appropriated annually as needed to maintain maximum quality, efficiency, and access under the Program. Or Congress could just do what Elizabeth Warren did in her opioid bill (below). This is very similar to S.1804 and should be fixed in the same way. Here is a link to the full text of a bill that funds the military. The word “tax” is nowhere to be found, and although the phrase “trust fund” appears once, it has nothing to do with funding the bill. Our government creates money because they want to. No human is taxed, no trust fund political tricks are played. No taxes, no nothing. They create this particular amount money because they’ve determined it to be the amount necessary to implement this bill. The same can and should be done with Medicare for All.